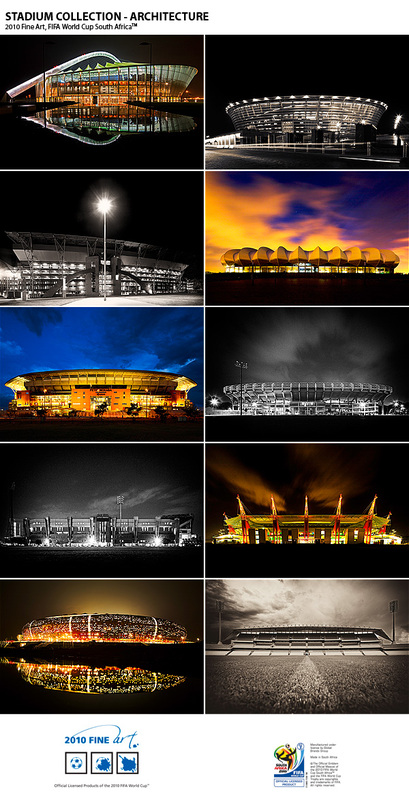 The ‘Architecture Collection’ comprises a single powerful image on each of the ten stadia that played host to the 2010 FIFA World Cup in South Africa – (from top left) Moses Mabhida Stadium, Durban; Greenpoint Stadium, Cape Town; Ellis Park Stadium, Johannesburg; Nelson Mandela Bay Stadium, Port Elizabeth; Peter Mokaba Stadium, Polokwane; Free State Stadium, Bloemfontein; Loftus Versfeld Stadium, Pretoria; Mbombela Stadium, Nelspruit; FNB Stadium, Johannesburg; & the Royal Bafokeng Stadium in Rustenburg. Flying into each of the venues to photograph the collection I had one night and one chance to find the magic that would positively showcase each of these wonderful structures to a worldwide audience. At the time many of the stadia were still chaotic construction sites and there was a mild panic about whether many of them would be finished in time, but anyone who’s in architecture and construction will know that that’s just the game we always play. The stadia were all finished in perfectly good time and the 2010 FIFA World Cup will surely go down in history as one of the most sensational and successful tournaments of all time.